The evolution of the Star of David – the most commonly associated symbol with Judaism. The Star of David (Magen David / Shield of David) is the most commonly associated symbol with Judaism today, but it is actually a relatively new Jewish symbol. It is supposed to represent the shape of King David’s shield (or perhaps the emblem on it), but there is really no support for that claim in any early rabbinic literature. In fact, the symbol is so rare in early Jewish literature and artwork that art dealers suspect forgery if they find the symbol in early works. When Theodor Herzl looked for a symbol for the new Zionist movement, he chose the Star of David because it was so well known and also because it had no religious associations. In time, it appeared in the center of the flag of the new Jewish state of Israel and has become associated with national redemption. Scholars such as Franz Rosenzweig have attributed deep theological significance to the symbol. For example, some note that the top triangle strives upward, toward God, while the lower triangle strives downward, toward the real world. Some note that the intertwining makes the triangles inseparable, like the Jewish people. Some say that the three sides represent the three types of Jews: Kohanim, Levites and Israel. While these theories are theologically interesting, they have little basis in historical fact. The symbol of intertwined equilateral triangles is a common one in the Middle East and North Africa, and is thought to bring good luck. It appears occasionally in early Jewish artwork, but never as an exclusively Jewish symbol. The nearest thing to an “official” Jewish symbol at the time was the menorah. In the middle ages, Jews often were required to wear badges to identify themselves as Jews, much as they were in Nazi Germany, but these Jewish badges were not always the familiar Star of David. For example, a fifteenth century painting by Nuno Goncalves features a rabbi wearing a six-pointed badge that looks more or less like an asterisk. In the 17th century, it became a popular practice to put Stars of David on the outside of synagogues, to identify them as Jewish houses of worship in much the same way that a cross identified a Christian house of worship; however, I have never seen any explanation of why this symbol was chosen, rather than some other symbol. The Star of David gained popularity as a symbol of Judaism when it was adopted as the emblem of the Zionist movement in 1897, but the symbol continued to be controversial for many years afterward. When the modern state of Israel was founded, there was much debate over whether this symbol should be used on the flag. Today, the Star of David is a universally recognized symbol of Jewry. It appears on the flag of the state of Israel, and the Israeli equivalent of the Red Cross is known as the Magen David Adom. 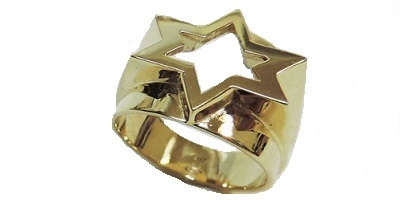 Check out our unique selection of Star of David pendants, Menorahs, Mezuzahs and many other Judaica items.